Its really been a long week and today has been a very long day! Emily has been having a hard time in several areas (meaning wanting to be home, getting sick, having peed in her pants)and so have Doug and I. No one will ever understand what it is like to stand in our shoes unless you have been there, you just can't. It is every parents worse nightmare to hear that your child has cancer, and it truly is devasting. As parents its hard to stand in these shoes and then feel like we have to function day to day with everything else that has to happen, going to work, keeping the house clean, change diapers, get dressed, just the day to day duties and then on top of that make sure that Emily doesn't get sick so keeping her safe from all the harmful germs out that. 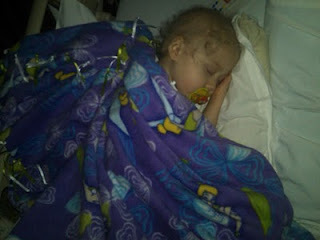 This past week has been really hard and even moreso that Brianna was diagnosed on Thursday with Influenza A. With finding that out, we haven't got to hang out with Brianna or even get to see Daddy all that much. So, the week has been very long and hard. I have tried to find ways to get Emily to take Tamiflu, but she hasn't been able to hold it down, so I haven't forced it. Brianna is taking hers, dad is putting it in ice cream and she is able to take it that way. Sorry to start the post off that way, but in all honesty, this is just hitting harder and harder as time goes. Doug and I just try to do what is right with everything and sometimes we will never know if it was right or wrong. It feels that this just gets old for everyone else involved but only involved not directly and to us every day is a new day, that we don't know what is going to happen and what it will bring. The past couple of nights have been filled with crying for many of reasons, but one because we miss our family being together and just being normal. Its hard to know what is normal before, but all the things that were normal before, we all just took for granted because so quickly they were taken away. We don't have a normal anymore, we don't know what the date is anymore, we don't even know if we were supposed to do something, because so much has been going on. There isn't free time anymore, I keep saying I need a haircut, maybe even a highlight or just something, Dad and I need a date to have some time together, but there isn't time and if there was time, I feel that we shouldn't be away and eats at me. Dad has been wanting to get things done around the house, and it is just hard to get all those things done that we just took for granted before. But unless you are a parent of a child with cancer, family memeber of a member with cancer or dealing with cancer yourself, you will never what it feels like. I can't sit and say I know what Emily is feeling in her mind or even thinking or how she feels. She is pretty good at voicing her opinion and her thoughts, but I only wish I knew what exactly she was thinking. but Dad and I only wish for her to be happy and as pain free as possible as she can be and we will jump hoops and wholes to do that for her. But what makes this even harder is that I miss my husband. I miss him. Emily misses him. He is my world, he is her world and I couldn't imagine going through this with anyone else and I could imagine Emily having any other than Doug because he is he is the best father that anyone could imagine.. But we don't have a lot of time with each other, and when we are together, life is chaos. Keep the house clean, make sure no germs are anywhere, taking Emily to the doctor, keeping the other girls well, grocery store, , working full time, it is just there is no time and honestly I can sit here and say I took for granted the time we had together before and I wish I could take that back and have done things differently, but I can't. So far this has been the worst round of chemo and I know it will be the same when we get to 5. 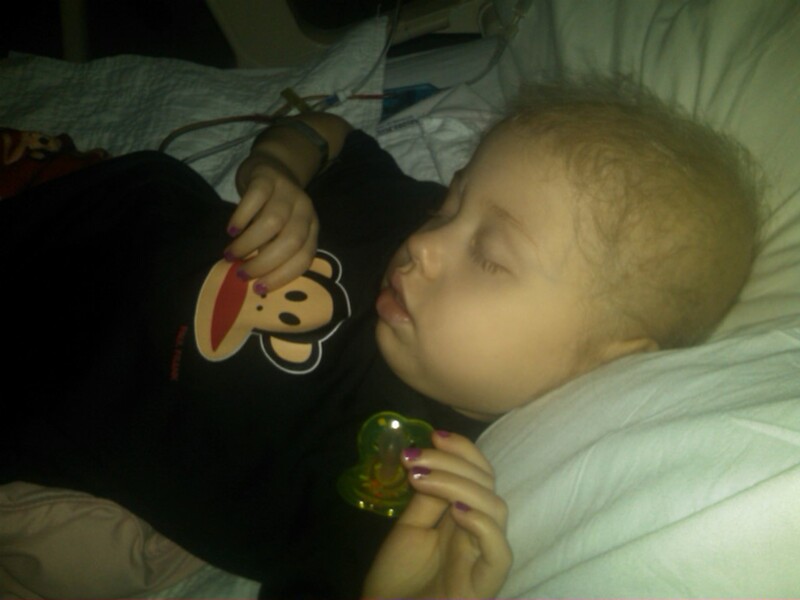 It hit Emily quick and just watching her dwindle from the effects of chemo just hit me hard. Here it is 3 AM in the morning and Emily finally went down to sleep after having about 4 episodes of getting sick within about an hour of time. Requested ativan and Emily is sleeping peacefully! Emily is such a sweet girl, while she is getting sick, I had her the pan to throw up in and she looks up in between throwing up and says "Thank you Mommy!" Our days have endured at least 2-3 tubs a day because they make her body feel better she says, at least 2-3 PJ's are changed a day because she either has an accident or gets sick on her clothes, bed changes because they are wet, cuddling, potty, more cuddling because Emily has been very clingy and throwing up and trying to figure out what she can hold down. We are still keeping up with the traumeel and Life Mel Honey and hoping that it keeps the mouth sores away and keeps the white blood counts up and trying to work that around when she is feeling ok and not throwing up. I hate to see Emily get sick, I hate to see her sad because we are here, I hate to see her sad because she misses her family and we haven't really gotten to see anyone. I hate to see her cry. On other note, CHOP (Childrens Hospital of Philadelphia) should have all of Emily's information and we should have an appintment to meet with the doctor and the surgeon in another week or so. I should be hearing from them on Monday to schedule that. We have heard some really good things about CHOP and look forward to meeting with them and getting a confirmed 2nd opinion and knowing where we are going moving forward with were we will be taking Emily for surgery after the 5th round and then just making sure that everything is diagnosed correctly and also making sure that all the spots were found and are known outloud. I'm sorry if this was sad, but Im not having a good day. Ready to hear this is over and it was only a nightmare, and you can now go home. WOO HOO, wouldn't that be nice!! Well tomorrow is a new day and Emily gets to go home. She is very happy about that. The vomitting could continue for another 48 to 72 hours. Her smells are crazy, because she can smell anything and if they are strong, she will throw up,. We never know what to cook her because she is constanlty changing in the food arena area. Emily never used to like chicken and here as of late she likes chicken. Emily will have her counts checked about 6AM and we will know where she stands before going home. We will have to bring her back on Monday to get her Nulasta shot and then charge on and hope that no fevers bring us back to the hospital. Love to babies and hold them tight. Make sure you tell them you love them and take each day and treasure it. Thank you all for your continued support and prayers that you all leave and say to use. Please leave a message on the guestbook, we are always reading them and they really help. THANK YOU! You are such a strong little girl...I am so proud of you for being so strong during this very tuff time. I want you to know that I am going to be here for you,mom and dad every step of the way. Mom and Daddy need to plan a night out and I will come over and we can play games,do art projects and cuddle together. We need to get mommy to teach me how to make organic cupcakes so that we can make lots and lots of them...haha! Stay Strong baby girl and we are going to win this battle with cancer!!! Love you EMILY MICHELE HUBBEL!!! I am here if you guys need anything...do NOT hesistate to pick up the phone and call me! Emily, you and the whole family are in my family's thoughts and prayers. We think about you all every day and pray Emily will make a speedy, healthy recovery!!! I have a 3 1/2 year old little girl and it really hits home to read about your sweet Emily. I hope you and Doug are able to get a nice uninterrupted snuggle in the next few days at home!!! No way can I imagine what your family is going through. Thank you for sharing Emily and your family's journey with us. My heart aches for you having such a sick beautiful baby and for the lose of your family time. I honestly can tell you that by reading the things you are going through it makes me appreciate my wonderful baby girl, who is 13, and hug her a little bit tighter. I try not to let the little moments of what seem to be hardship get to me because I know that things could be far worse than anything I've had to ever even imagine, much less endure. We pray for you and your family and for a time of peace and comfort and for God to give you back your "normal" family to be able to share lots of hugs, kisses, memories and laughter!